People get tattoos for many reasons. Some tattoos have a deep personal meaning for the wearer, an important quote or favorite symbol. Some get their tattoos simply as a way of decorating their skin. There are as many different reasons for the tattoo as there are tattoos themselves. But people change. And just as there are many reasons to get a tattoo, there are many reasons to get them removed. A tattoo can suddenly be a reminder of something or someone hurtful from the past, or it might not have the same aesthetic charm it used to have. Circumstances change too, and people often have to cover up or entirely remove their tattoo to accept a newer, better job. Whatever the reason, laser tattoo removal is the fastest, safest and most effective way of getting rid of your tattoo. In the past, tattoos could only be removed using incredibly painful techniques, like burning them off with acid or even rubbing them with salt to fade the ink. With laser technology, tattoos can be removed with one or more visits to Dr. Aldridge’s office depending on the size, age, and complexity of your tattoo to be removed. Before we begin removing the tattoo, a patient will meet with the team for a consultation. The doctor will go over the process with the patient at that time, determining which tattoo is to be removed or faded and going over the procedure in detail. The patient will be encouraged to ask any questions they might have at that time. It’s incredibly important that each patient is completely comfortable and satisfied with the procedure. 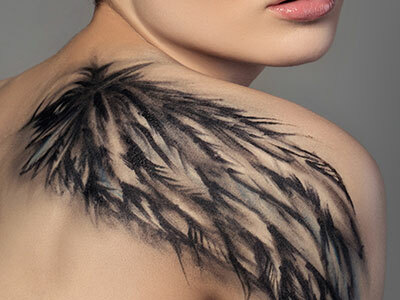 On the day of the procedure, the tattoo area will be cleaned and prepped, and the laser technician will apply the laser to the area in question. They will then shoot short bursts of high-frequency light at the tattoo, thereby breaking up the pigments in the ink. The body then absorbs the ink and removes it through natural processes. Although laser tattoo removal treatment can be painful for some, Dr. Aldridge’s tattoo removal experts ensure that patients are comfortable by offering various numbing techniques to lessen discomfort. Most patients describe the feeling similar to being snapped with a rubber band, but the technician will make sure the patient is comfortable throughout the treatment. Depending on the type and complexity of the tattoo, one or more sessions may be required to completely remove the tattoo. There’s no reason to live with an unwanted tattoo. Let Dr. Aldridge and his team restore your skin. Contact his offices today to schedule your consultation.